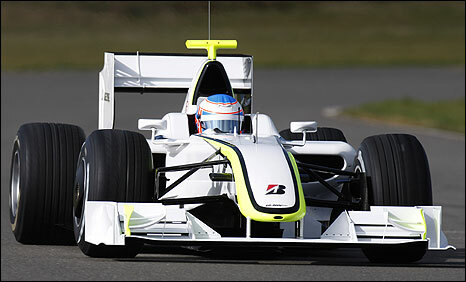 The former Honda Formula One team has been saved and will contest the 2009 season as Brawn GP. 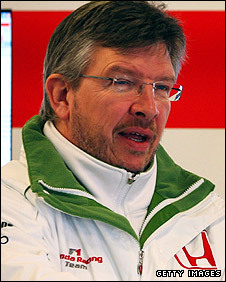 Team boss Ross Brawn, a former Ferrari technical director, said he had bought the team from Honda. Britain's Jenson Button and Brazilian veteran Rubens Barrichello, last year's Honda line-up, will continue to drive for the British-based team. Brawn GP will use Mercedes engines when the new F1 season starts in Australia on 29 March. Button was at the wheel for an initial shakedown test at Silverstone on Friday. The 29-year-old is understood to have taken an extensive pay cut from his former salary of a reputed £8m as part of the rescue deal. "I believe he's taken a 50% pay cut to ensure that he remains in the sport," said BBC 5 Live race commentator David Croft. "I suppose the fact that he will be on the grid at all could be enough for him in the near future." Honda pulled out of F1 in December as a result of the global financial crisis, leaving the team to search desperately for a buyer. A statement, released on the new Brawn GP website, did not reveal the financial details of the buyout or whether Honda's 700 staff would remain in their jobs. Brawn said that he would "continue to be supported by the incumbent management team". He admitted that the team's lack of testing would cause problems this season, but said he was optimistic they would have a good season. "The biggest hurdle we faced was being in a position to race in Melbourne and we will now be able to achieve that target," Brawn said. "Initially, we may experience some reliability issues resulting from the lack of track time but we feel we have a good car and we hope that our performance will be respectable. "We are confident in the fundamental design principle of the car and look forward to the opportunity to develop it further as the season progresses." Brawn, 54, added: "The past few months have been extremely challenging for the team but today's announcement is the very pleasing conclusion to the strenuous efforts that have been made to secure its future. "Firstly, it is a great shame that having worked with Honda Motor Company for so long we can no longer continue together. "I would like to thank Honda for the fantastic co-operation and support we have received throughout this process, particularly those members of the senior management who were closely involved with concluding our agreement, and for the faith they have demonstrated in myself and our team." Barrichello, 36, ended last year out of contract with Bruno Senna, nephew of the late triple champion Ayrton, reportedly lined up as a possible replacement. However, the sale of the team has led to the Brazilian celebrating a new lease of life. Barrichello told his website www.barrichello.com.br: "During this period of hard times I kept my faith, worked my body out hard and kept quiet, speaking only to the team's personnel. "I start the year very anxiously, because we'll have only a few tests before the first race, but with a car that will be fast and with a very good Mercedes motor behind us. I'm looking forward to it." Brawn, who joined Honda at the start of last season, added that he was pleased to retain the same driving line-up. "The vast experience and knowledge that both drivers bring to our team will prove invaluable as we aim to get up to speed in the shortest possible time to be ready for the first race of the season," he said. "In what will be their fourth season together, their experience with our team in Brackley, our systems and our engineers, will prove a real asset." He added: "I would like to express particular appreciation for the support we have received from Mercedes-Benz Motorsport, (F1's governing body) the FIA, (commercial rights holders) FOM, Fota (Formula One Teams Association)... and our many fans the world over. "The journey ahead will be challenging but exciting and we know we can count on their continued enthusiasm for our team and its ambitions." Hiroshi Oshima, managing officer of Honda Motor Company Limited, wished Brawn well in his new role as team owner. "Since announcing our withdrawal from Formula One racing on 5 December of last year, we have conducted various studies and discussions so that the team can continue its activities as a new team," said Oshima. "We are very pleased that we could sell the team to Ross Brawn, with whom we have been partaking in the challenges of F1 competition, and are grateful for his decision. We offer our sincerest wishes for the new team which will be led by Ross." Brawn GP will attend the remaining pre-season tests, in Barcelona starting on 9 March and Jerez starting on 15 March. With the team's survival, Formula One will start the season with 10 teams - one fewer than at the beginning of 2008 before Super Aguri folded.